Assembly Round Up: Plenary Sessions - What are they and when are they? Plenary Sessions - What are they and when are they? Plenary sessions are when the MLAs meet in the Assembly Chamber to check and challenge the work of the Executive, consider proposed laws, debate and discuss the issues that impact on your everyday life. 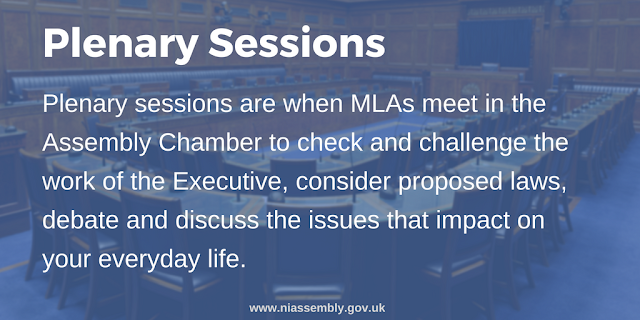 They are chaired by the Speaker and are one of the many ways MLAs carry out their roles as democratically elected representatives. How do I find out what MLAs will be debating? For each Plenary there is an Order Paper. This is the agenda for each meeting. 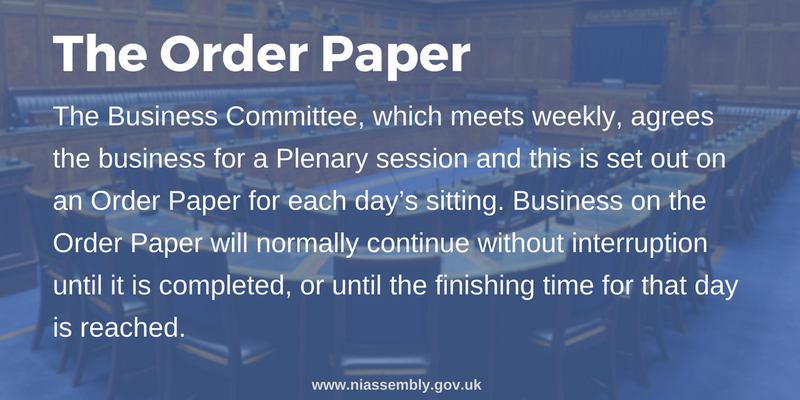 The Order Papers are set by the Business Committee who meet each week to agree what business to include for each meeting. Can I get attend a Plenary? Plenary takes place twice a week on Mondays and Tuesdays and is open to the public . A transcript of Plenary meetings is published in the Official Report (Hansard) and made available on the Assembly website. You can also watch it live on niassembly.tv. Embed This blog post on your own site.